Recommened for everyone!!!! 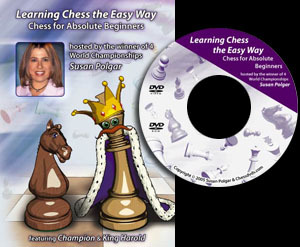 This dvd covers lessons in, tactics, checkmates, rules, notations, setting up the board and everything there is to know for a beginner to learn how to play chess. Guarantee To Improve your chess Receive private Chess lessons from the Grand Masters for a fraction of the cost!